Putting issue #7 together was rough emotionally. My younger brother died suddenly in July 2002. A month later, I developed a goiter and survived the first needle biopsy of my throat. In September, my dad underwent a second round of open-heart surgery. It seemed Death was all around, nibbling at my family. 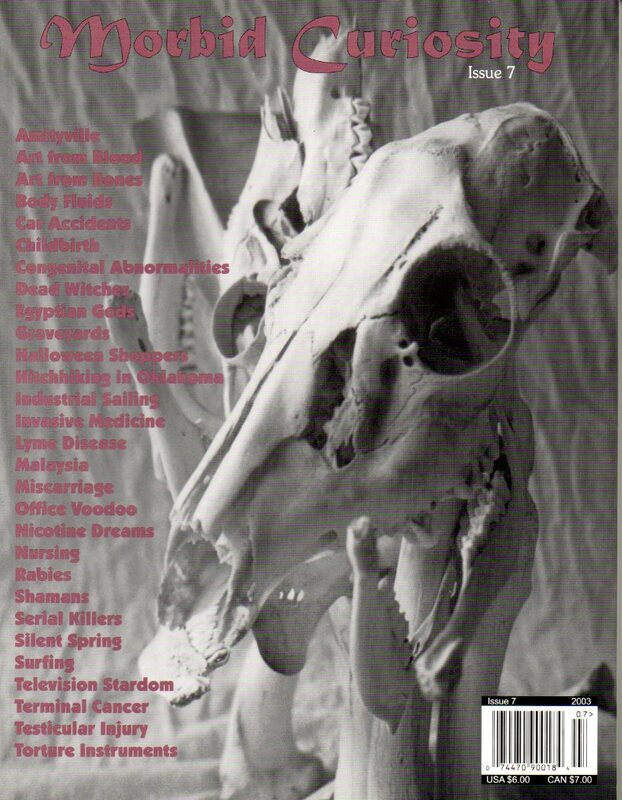 Themes often spontaneously developed as I assembled each issue of Morbid Curiosity. This time, as I wrestled with the knowledge that my (hypothetical as yet) child would never know her uncle — and might not know my father — I received a flood of essays on human reproduction. Alison Renner received the diagnosis that she had a double uterus, which she helpfully illustrated with her own medical photo. Mark Hodgetts supported his wife through a spontaneous miscarriage. Beth Touchette-Laughlin, whom I’d just met in a writing class, wrote about delivering her son after four days of labor. Stephanie Rose decided she wasn’t cut out for motherhood and took the necessary steps at age 29, against all medical advice. She also included a photo of her insides. As I edited the issue, I worried that I would never be able to get pregnant. Once I did, my blood pressure skyrocketed and there were questions about whether I could keep the pregnancy, whether my daughter would be normal. I struggled through morning sickness when we did the release party in May 2003. By August, not even a year after my goiter, I was hospitalized, put on bed rest, and my daughter was delivered seven and a half weeks early. While I lay in the hospital, awaiting her birth, I read submissions for Morbid Curiosity #8: because that’s kind of morbid woman I am. You can still order a copy of #7 here. #8, unfortunately, has gone out of print. This entry was posted in Books for sale, Editing and tagged memoir, Morbid Curiosity magazine, personal essays. Bookmark the permalink. Sometimes troubles come all at once! Wow! You are determined. I know you daughter is very special to you!